You know what pairs nicely with watching some of the most physically fit people on the planet battling to prove that they are in fact the best in the world at their sport? Liquor. This year’s Olympic games in Rio is shaping up to be a summer games to remember. If you’re not likely to personally take home a medal in sports, bring home the gold in cocktails with one of these epic Olympic-themed drinks designed just for this year’s games. Preparation: Combine Dickel Rye, POM, fresh lemon juice and honey ginger syrup into a cocktail shaker. Shake well. Strain contents into a Collins over ice. Garnish with lemon wheel. 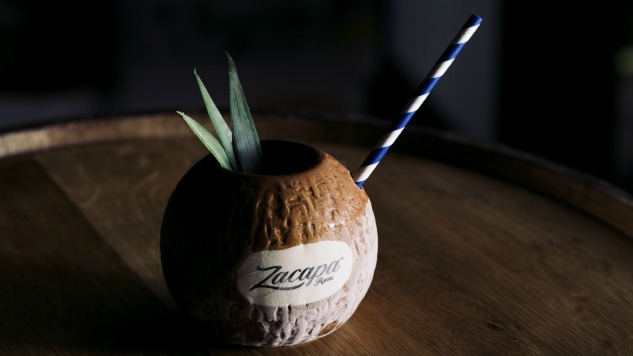 Preparation: Combine Zacapa, lime juice, pineapple juice, coconut milk, coconut water and cinnamon syrup into a cocktail shaker. Shake well. Strain contents into cocktail glass over ice. Preparation: Combine all ingredients into a rocks glass and stir. Preparation: Combine Tequila Don Julio Blanco, fresh lemon juice and fresh mint and snap pea syrup into a cocktail shaker with ice. Shake well. Strain contents into a rocks glass over fresh ice. Garnish with mint sprig. Preparation: Combine fresh mint, split open fresh snap peas and simple syrup into a large glass bottle. Place bottle into a large pot of water and heat to 120 degrees for 4 hours. Strain contents through a fine strainer. Add sea salt and let cool. Preparation: Combine Ketel One, St. Germain liqueur, absinthe, lime juice, agave syrup and strawberry puree into a blender with ice. Blend. Pour contents into a tall party glass. Emily is Paste’s Assistant Drink Editor, and is secretly hoping that they add “napping” as an official sport in 2020. Track her training on Twitter @emily.